. . . enough time for me to resurface to say that (1) Valkyrie rules, for the love of God don’t let Tom Cruise stop you from seeing it; and (2) MIRRORED HEAVENS has made Pat’s Fantasy Hotlist top SFF reads of the year (20 out of 20, but hey, no complaints this end). Hope everybody’s enjoying the holidays. . .
I’m signing off for a few days; any hammering or chainsawing you might hear in the meantime is the roadies putting together a new stage/set. The curtain goes up after New Year, so stay tuned. I might resurface early in the event that India starts letting Pakistan have it, but hopefully they’ll be sporting enough to wait for 2009. And oh yeah, happy #$# holidays. . .
“You oughta take those fists down to parliament”—so said John Lydon (aka Johnnie Rotten) at one of the first PiL shows as he surveyed the chaos going down in the audience. But why bother when the legislators are already at it? Check out at these awesome videos of rumbles/fistfights breaking out in various national legislatures/congresses/parliaments. India’s is probably the best, but they’re all pretty good. And now my cat is making a beeline for the keyboard, so I have to run some interference of my own. Later. . .
Do you realize just how little info there is out there on third generation nukes? It’s a crying shame. Federation of American Scientists even highlights information on fourth generation nukes without saying anything about the third generation. Which is a travesty, as third generation hardware is easily the coolest. Essentially it constitutes a mechanism to deploy a warhead like a beam weapon: you detonate the device and channel the x-rays at the target and whammo. Besides my, er, private collection (of articles, not weapons) the best I can find out there is an old piece in TIME from more than twenty years ago, which isn’t that surprising, given that these weapons were intended to be the crown jewel in the SDI system. There are times I miss the ’80s. As if Obama didn’t have enough to worry about, Russia is finalizing the sale of top-of-the-line air defense systems to Iran. This will be one more issue that will be thrown into the U.S.-Russia negotiations mix, on top of missile defense, the Ukraine, Georgia, etc. Russia may/may not have any intention of actually going ahead with this, but Iran undoubtedly can’t wait to get its hands on the S-300s ground-to-air missiles that comprise the core of the hardware. Watching the preview for Valkryie has got me diving back into my WWII library: am (re)reading Bevin Alexander’s How Hitler Could Have Won World War II (I love titles that get straight to the point). The core of the argument is essentially a rehash of the advice that Raeder gave Hitler in 1940: delay a reckoning with Russia and turn south instead by taking Gibraltar and turning the Mediterranean into an Axis lake. By dedicating a fraction of the forces earmarked for Barbarossa, Germany could have driven into Egypt and onward into the MidEast oil fields. At that point, Russia could have been attacked from both the west AND south, and Britain might have thrown in the towel anyway. And with 20/20 hindsight, that’s kinda hard to argue with. (Though I should note I tried wargaming this approach in Third Reich a few years back, and it was a complete disaster. Then again, most of these “strategy” games are designed to make it very difficult to stray from the actual way events unfolded.) Still, I gotta admit I’ve always thought that Germany’s decision to go east in 1941 wasn’t anywhere near as mad as the results would seem to indicate. Most of the people saying it was an Incredibly Dumb Idea miss some all-too-basic points, but I’ll save those for a later post. . .
-Getting an old-fashioned shave at a retro barbershop—my closest shave EVAH. I tried to re-enact the barbershop scene in Chinatown with the guy in the chair next to me, but I’m not sure he’d seen the movie. -Getting an In and Out Burger and eating it while stuck in traffic. -Realizing somewhere over the midwest that I’d locked the deadbolt lock on my apartment door, and that I’d failed to give the catsitter that key. A frantic visit to a FedEx in the LAX vicinity prevented The Cat from experiencing a sudden interruption in his supply of dead meat. -Rewatching Serenity and realizing that it’s not the piece of crap I thought it was the first time I saw it. -Not working on anything related to Autumn Rain for a period of 96 hours. Christ, I’m going soft in my old age. FedExed the manuscript to Bantam yesterday; it’s all over. 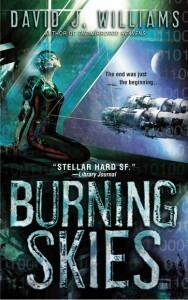 You won’t see THE BURNING SKIES for a few more months, but you can feast your eyes on the cover in the meantime. Among other things, the book features (a) the return of Autumn Rain, (b) my entry for the Most Insane Space Battle Ever Sweepstakes (trust me, you’ve never seen anything like it), (c) the long awaited meetup of all the characters, (d) several hundred instances of the f-word, (e) action at L2, L3, and L5, (f) a Eurasian secret weapon, and of course, (g) total mindfuckery. It was a long haul (long enough to make me wonder if second novels are the toughest), but I’m pleased with the result. And now I’m off to the west coast to lie low for a few days. Back soon enough. . .
For sheer chutzpah, Blagojevich certainly gets a prize, but it’s worth remembering that when it comes to selling public office, he’s a rank amateur compared to the all-time recordholders, the Praetorian Guard back in 193 A.D. If you believe Ridley Scott’s version, once Commodus was dead, Russell Crowe’s body was carried out of the Colosseum covered in flowers and the Republic was restored amidst a suitably uplifting musical score. Of course, what really happened is that the Praetorians auctioned off the entire empire in a single night, and the lucky winner was Senator Didius Julianus, who enjoyed the throne for all of two months before Severus’ troops marched in from the Rhine and chopped him into little bitty pieces. Before it’s all over, Blagojevich will undoubtedly be wishing for a similar fate. Amidst all the uproar over my cat last week, I’m only just now getting to the long-awaited report by Congress on weapons of mass destruction. The key soundbite: “unless the world community acts decisively and with great urgency, it is more likely than not that a weapon of mass destruction will be used in a terrorist attack somewhere in the world by the end of 2013.” The report goes on to say that the most likely source of any nuclear device would be Pakistan, given that they’ve been peddling their nukes in every Central Asian bazaar they can find. If this sounds depressing to you, just imagine how I feel about it: I live in Washington D.C. (why, I’m not so sure). My cat remains blissfully unaware of all this, though he would probably welcome any scenario in which mice start to glow.